Just to be…home at last. Caribou, lobsters, warblers, arctic terns, and many other animals have two homes and migrate in between. 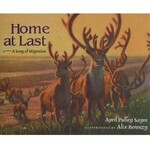 Join migration creatures on their journey and rejoice when they reach their destination with the soothing refrain “home at last.” This bedtime book, which has many layers of meaning, is also a great classroom book for the study of fluency, voice, and refrain.